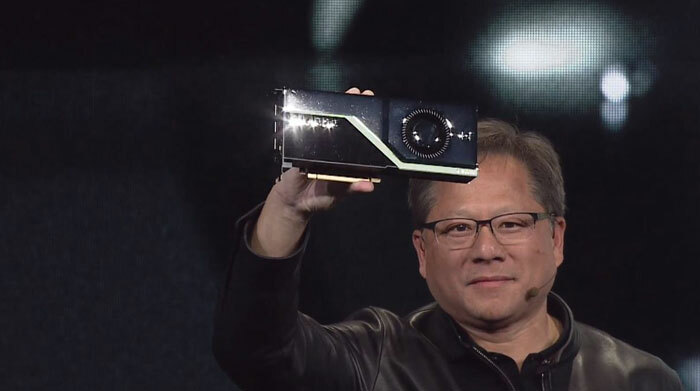 Nvidia's CEO Jensen Huang took the main stage at SIGGRAPH 2018 yesterday evening to unveil Turing, the firm's eighth-generation GPU architecture. The new architecture is claimed to be "the greatest leap since the invention of the CUDA GPU in 2006," and will bring real-time ray tracing to tomorrow's applications. "This fundamentally changes how computer graphics will be done, it's a step change in realism," Huang told the SIGGRAPH audience. "It has to be amazing at today’s applications, but utterly awesome at tomorrow's". To get the best out of the new architecture will of course need Nvidia and software partners to work hard on building from the foundations of the Nvidia RTX development platform. 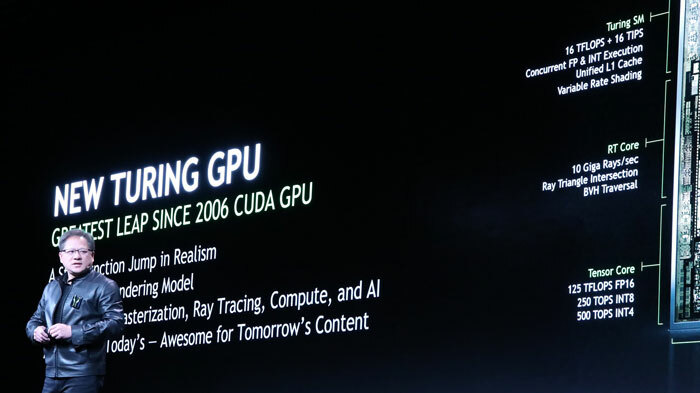 Nvidia, for its part, has "a brand new software stack for computer graphics merging rastering and ray tracing, computing and AI," according to Huang. Now that Turing has been officially announced Huang revealed that more than two dozen key ISVs are already working on RTX support. Software support will be delivered by well known companies such as Adobe, Autodesk, and Pixar - on the content creator side of things. For entertainment and games support Nvidia named EA, Epic Games, and Remedy as early adopters of RTX technology. Probably the most interesting gaming industry assertions came in a testimonial from Epic which said "Just as we saw with the movie business over a decade ago, ray tracing is going to revolutionize the realism of real-time applications, cinematic experiences and high-end games". Epic added that gamers should look forward to content that is "indistinguishable from reality". Nvidia showcased four new hardware products utilising the new Turing GPU last night, the $2,300 Quadro RTX 5000, $6,300 Quadro RTX 6000, and $10,000 Quadro RTX 8000 plus the Quadro RTX Server with eight Turing GPUs (POA). These products will be available via Nvidia.com from Q4 this year. To illustrate the power that the new pro graphics cards will deliver, Huang fired up the now familiar Epic Games Star Wars-themed Reflections ray-tracing demo. At the GDC in March this demo ran in real-time on the $70,000 DGX Station equipped with four Volta GPUs. This time the demo ran on a single Turing GPU, the Quadro RTX 8000. "This is the world’s first ray-tracing GPU," crowed Huang. Inside the Turing GPU are a mix of cores, adept at the various tasks that are required of GPUs nowadays. 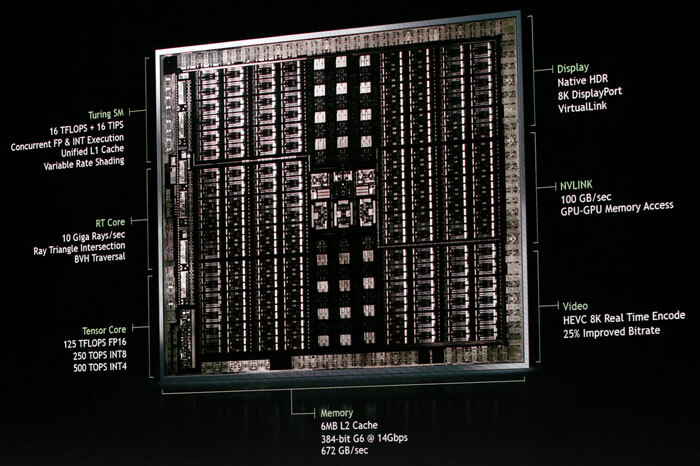 In addition to the familiar CUDA cores these GPUs include various amounts of RT cores and Tensor (AI) cores. Turing-based GPUs feature a new streaming multiprocessor (SM) architecture that adds an integer execution unit executing in parallel with the floating point datapath, and a new unified cache architecture with double the bandwidth of the previous generation. In the above real-time ray tracing demo the Turing RT cores are claimed to have accelerated real-time ray tracing operations by 25x over the previous Pascal generation. Furthermore, these GPUs can be used for final-frame rendering for film effects at more than 30x the speed of CPUs. If you are wondering about the value of the AI cores, with regard to graphics, Nvidia explains that they can work to provide denoising, resolution scaling and video re-timing and more. In the video below you will see a teaser video from Nvidia dubbed 'Be For The Game'. In the comments section Nvidia follows up to ask "Did you catch everything? See you on the other side...". HEXUS regulars will be well aware that Nvidia is expected to reveal its consumer/ gamer/ enthusiast Turing-based graphics cards at Gamescom 2018, next week in Cologne. The clues in the video are mostly within the chat excerpts. If you look and pause at the correct places you will see various chat users with names with the following text strings; 'RTX', 'not_11', multiple '20', '80', and similar references. It's pretty awesome that we'll be seeing ray-tracing graphics in real time, but I can't help wondering if it's what's needed. Personally, I'd prefer a game that looks fine (most recent AAA games are way prettier than this), but has really immersive game-play elements. I'm sure we could utilise GPU resources more appropriately for immersive AI and 3D sound processing. One thing that immersion relies on is how believable an environment is, especially from a game play point of view. Getting graphics as near-to-life as possible will make a massive difference especially in a gaming age were higher resolutions are more sought after. I was really hoping to buy AMD and go for freesync, but this could be a big fat steel toe cap to face of RTG as far as general consumer cards go. Saying this is the death of AMD is a bit extreme. The ray tracing demo was running on a $10,000 card. While impressive it's still a long way from consumer tech. And is it the same quality as the original on the DGX? What I do know is if AMD weren't there nVidia wouldn't be pushing at all, look at what Intel have done since Zen came on the scene.